The red outline centered on this aerial photo map shows the CAP 2-7-2 area of operations through 1970 and 1971. The outline obscures QL-1 (Highway 1) on the right. The Song Thanh Quit bridge is just above the red number 5 in the lower right-hand corner. 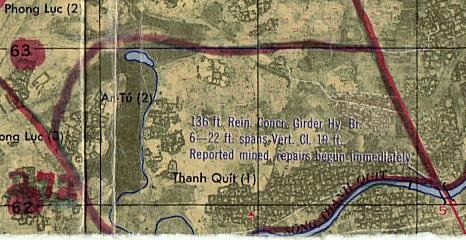 The text in the middle of the 2-7-2 AO describes the Thanh Quit river bridge, but I don’t know what to make of the notation, “Reported mined, repairs begun immediately. The bottom of the 2-7-2 AO is cut off because that’s the bottom edge of Jim’s map.